Berries & Cream Stuffed French Toast Casserole – Slices of French bread stuffed with fresh berries & cream cheese filling, covered in a custard mixture and baked until perfectly fluffy and slightly crispy on top. I’ve always woken up with a sweet tooth. Ever since I was a little kid, I always preferred pancakes to eggs and bacon. I guess that explains why you’ll find so many sweet breakfast recipes on the blog, like these strawberries & cream danish, these blackberry & cream doughnuts, or this blueberry coffee cake. So it’s no surprise that I have yet another sweet breakfast treat for you guys. And it’s also another great option for brunch this holiday season because it’s super impressive, can feed a ton of people, and its super easy to throw together. Check out my Berries & Cream Stuffed French Toast Casserole! To make this french toast casserole, it’s very similar to this bananas foster french toast casserole I made last year. The biggest differences are that you don’t have to let it sit before baking. You simply assemble the casserole and then immediately pop in the oven! You’ll also notice that the french bread is sliced in this casserole instead of cubed. That makes the bread soak up the custard almost immediately, which is why we can bake immediately without letting it sit. For the filling, the creamy stuffing is made from a cream cheese base so when it bakes, it tastes almost like a cheesecake. Yup, I was serious when I told you I love dessert for breakfast! But the berries make it healthy-ish right??? Since we’re not letting the casserole soak for a while before baking, you do not want to use old, crusty bread for this recipe – or else it will never soak up all the custard in time. I bought a fluffy loaf of french bread (not super crusty and tough on the outside) to make sure it was soft enough for this casserole. The cream cheese filling is made just like a cheesecake – by beating cream cheese, eggs, vanilla, and sugar. Just as you would with cheesecake, make sure to fluff up the cream cheese with a mixer before adding the other ingredients. Because this casserole is made with tons of eggs, you need to let it sit for 10-20 minutes after baking to let the eggs “calm down” and come back together. Otherwise, it will be sloppy when serving. Alright guys – there you have your favorite new breakfast casserole. Make sure you add it to the list for all you holiday breakfasts this year – especially Christmas morning! Slices of French bread stuffed with fresh berries & cream cheese filling, covered in a custard mixture and baked until perfectly fluffy and slightly crispy on top. Preheat oven to 350 degrees. Grease a 13x9 rectangular pan. Place 8 of the bread slices in one even layer at the bottom of the pan. Set aside. Make cream cheese filling by adding cream cheese to a bowl of a stand mixer and beat with a paddle attachment until light and fluffy, about 3 minutes. Add 1/4 cup sugar, egg, and vanilla extract. Beat until blended. Pour mixture over prepared pan with slices of bread. Spread with a spatula to create an even layer. In a separate medium bowl, add berries and remaining 1/2 tablespoon of sugar. Toss to combine. Toss over the cream cheese filling. Top casserole with remaining 8 slices of bread and press down. In a large bowl, add 7 eggs, ground cinnamon, vanilla extract, and salt. Whisk until eggs are beaten and mixture is combined. Add milk and half and half and whisk gently to combine. Pour mixture slowly over casserole, ensuring that it's evenly distributed. Push down with the back of a spoon to ensure bread soaks up all the egg mixture. Bake casserole in preheated oven until fully-cooked, about 50-60 minutes. Remove from oven and let it sit for 10-20 minutes before serving. Think if I used old bread, I could do this as an overnight casserole? Looking for something overnight to do for a girl’s weekend coming up and this looks AMAZEBALLS!! Yum, I need to make this for my kiddo! This casserole looks oh so tasty! I definitely want to try making this myself–saving the recipe! YUM! This just looks so good. I definitely need to make this for my fam this holiday season – they’d be so impressed. Thanks for sharing! They really will! Let me know how much they love it! Ohmygoodness! This looks fabulous! I’m with you — I always wake up with a sweet tooth (and it stays with me pretty much all day)! What a great recipe! Yeahhh! I knew I could count on you to be the same way!! Wow! Great recipe! I’m definitely trying this one out! Thanks for sharing! This looks so good. I’ve never seen this done before. What a fantastic recipe to try! It’s mouth-watering! Yummy! Oh my goodness, this looks delicious!! I pinned to make later! I want to pin for later but can’t find the button! It looks so delish! This recipe looks amazing. I can’t help but think that it would be great on Christmas morning! Looks delish!! 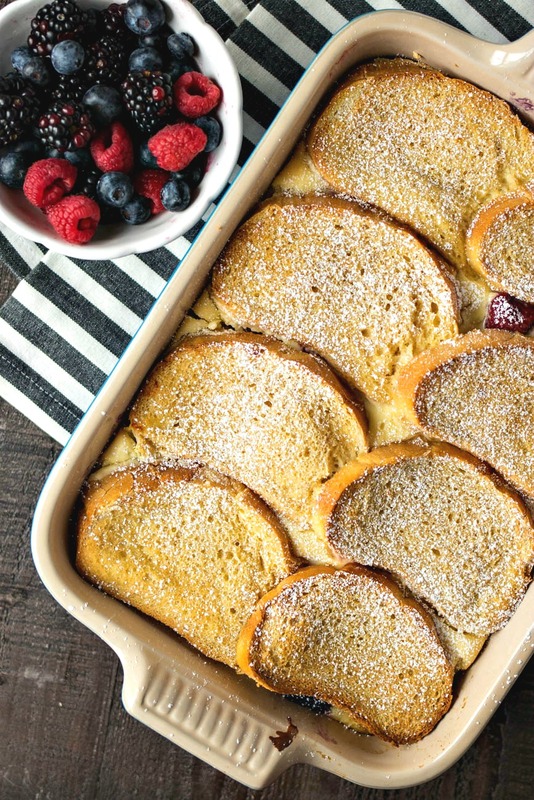 I’m such a fan of french toast casseroles. Thanks for the recipe! Right?! I love them so much, too! This looks amazing!! ANother one of yours I want to try! !